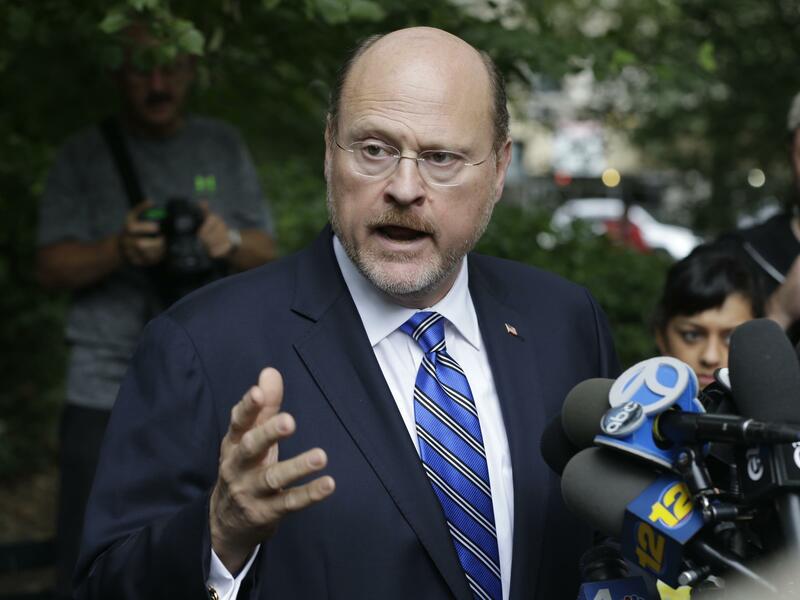 Republican mayoral hopeful Joe Lhota speaks at a news conference Monday. Democrat Bill de Blasio embraces a supporter on the steps of City Hall on Monday. This week, the center of New York City's political universe was downtown Brooklyn. With the dust settling from the mayoral primary, the two candidates who will be on the ballot to replace outgoing Mayor Michael Bloomberg both live in the city's biggest borough. On Thursday, Republican candidate Joe Lhota shook hands with voters pouring out of the subway a few blocks from his home in Brooklyn Heights. "When I first moved here 25 years ago, no one wanted to come visit me in Brooklyn," Lhota says. "Now they all live here as well. It's really symbolic, it's emblematic, of how Brooklyn is in ascendancy." The former city transit chief was born in the Bronx and lived most of his adult life in Brooklyn. Lhota says that definitely affects how he would govern. "It'll have a big difference," he says. "You gotta listen to the people in the boroughs. That's where most of the people are." On the other side of the ticket, Democrat Bill de Blasio was in downtown Brooklyn Friday to accept the endorsement of another prominent Brooklyn Democrat, Sen. Chuck Schumer. Schumer and de Blasio stood on the steps of Brooklyn's Borough Hall in front of a diverse crowd of supporters, including black, white, Latino and Asian leaders from across the city. "This is why we are winning this campaign," de Blasio said. "Because we have every type of New Yorker working hard every day to bring about changes we need." 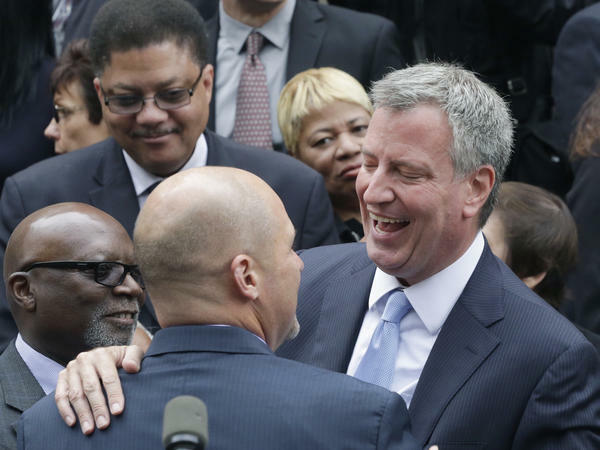 De Blasio, the city's public advocate, did well across New York in the primary election. But he dominated Brooklyn, winning in virtually all of the borough's neighborhoods and demographic groups. Brooklyn may be the city's biggest borough, with 2.5 million people, but it has traditionally lagged behind Manhattan when it comes to power and prestige. That's changing, says Carlo Scissura, president of the Brooklyn Chamber of Commerce. "For a decade, we've been talking about how cool Brooklyn has become," Scissura says. "The artists live here, the writers live here. It was just a matter of time that the political landscape was going to shift here as well. And it has." The city's politics have definitely changed since the last time a Brooklyn resident was elected mayor, when Abe Beam won in 1973. The neighborhoods along the East River, facing Manhattan, have boomed in the last 20 years. But in other parts of the borough, unemployment and crime are still high — and many New Yorkers feel left out of the city's recent prosperity, says Douglas Muzzio, who teaches public affairs at Baruch College, part of the City University of New York. "One of the things that resonated in the de Blasio campaign is that there's inequality," he says. "And the inequality is growing. And that what we need to do as policymakers is refocus on not Manhattan, not the elites, not big business." Two polls this week show de Blasio with a commanding 40-point lead over Lhota heading into the Nov. 5 general election. A lot of de Blasio's success may be connected to fatigue with the third term of Mayor Michael Bloomberg, a Republican turned independent. Brenda Haggard of Fort Greene, Brooklyn, says the Bloomberg administration puts Manhattan ahead of the other boroughs. "He didn't pay attention to Brooklyn at all, if the truth be told," Haggard says. "And he can't be out soon enough for me." Whoever wins, Kerryann McNish of Crown Heights hopes the next mayor will be more focused on Brooklyn's concerns. "They're from here, so they know the area," she says. "And what problems we face, definitely, like gun violence. And education. Our school system; it's failing our children." The dust from New York City's mayoral primary has begun to settle. We know who's going to be on the ballot to replace Mayor Michael Bloomberg. But no matter who wins in November, there will be cheering in Brooklyn because the Republican nominee, Joe Lhota, and the Democratic candidate, Bill de Blasio, both live in the borough. So it's all but certain that New York will have a mayor from Brooklyn for the first time since the 1970s. Many New Yorkers apparently hope that will also lead to a shift in the city's priorities, as NPR's Joel Rose reports. JOEL ROSE, BYLINE: This week the center of New York's political universe was downtown Brooklyn. ROSE: On Thursday, Republican candidate Joe Lhota shook hands with voters pouring out of the subway a few blocks from his home in Brooklyn Heights. JOE LHOTA: When I first moved here 25 years ago, no one wanted to come visit me in Brooklyn. Now they all live here as well. It's really symbolic. It's emblematic of how Brooklyn is in ascendency. ROSE: The former city transit chief was born in the Bronx and lived most of his adult life in Brooklyn. Lhota says that definitely affects how he would govern. LHOTA: That will have a big difference. You have to listen to the people in the boroughs. That's where most of the people are. ROSE: Lhota isn't the only candidate playing up his outer-borough credentials. Democrat Bill de Blasio was in downtown Brooklyn yesterday to accept the endorsement of another prominent Brooklyn Democrat, U.S. Senator Chuck Schumer. SENATOR CHUCK SCHUMER: Good morning everybody. It's great to be here in Brooklyn. ROSE: Schumer and de Blasio stood on the steps of Brooklyn's borough hall in front of a diverse crowd of supporters, including black, white and Latino and Asian leaders from across the city. BILL DE BLASIO: This is why we are winning this campaign, because we have every type of New Yorker working hard every day to bring about the changes we need. ROSE: De Blasio, the city's public advocate, did well across New York in the primary election, but he dominated Brooklyn, winning in virtually all of the borough's neighborhoods and demographic groups. Brooklyn is the city's biggest borough with two and a half million people. Still, it has traditionally lagged behind Manhattan when it comes to power and prestige. But that's changing says Carlo Scissura, president of the Brooklyn Chamber of Commerce. CARLO SCISSURA: For a decade we've been talking about how cool Brooklyn has become. The artists live here, the writers live here. It was just a matter of time that the political landscape was going to shift here as well. And it has. ROSE: The city's politics have definitely changed since the last time a Brooklyn resident was elected mayor, when Abe Beame won back in 1973. The neighborhoods along the East River facing Manhattan have boomed in the last 20 years, but in other parts of the borough, unemployment and crime are still high and many New Yorkers feel left out of the city's recent prosperity. Douglas Muzzio teachers public affairs at Baruch College. DOUGLAS MUZZIO: One of the things that resonated in the de Blasio campaign is that there's inequality and the inequality is growing, and that what we need to do as policymakers is refocus on not Manhattan, not the elites, not big business. ROSE: Two polls this week show Democrat Bill de Blasio with a commanding 40-point lead over Republican Joe Lhota. A lot of de Blasio's success may be connected to fatigue with the third term of mayor Michael Bloomberg, a Republican turned independent. Brenda Haggard of Fort Greene, Brooklyn says the Bloomberg administration puts Manhattan ahead of the other boroughs. Do you think he paid enough attention to Brooklyn or not? BRENDA HAGGARD: Absolutely not. He did not. He didn't pay no attention to Brooklyn at all, if the truth be told. He can't get out of office soon enough for me. ROSE: Whoever wins, Kerryann McNish of Crown Heights hopes the next mayor will be more focused on Brooklyn's concerns. KERRYANN MCNISH: They from here so they know, like, the area and what problems we face, definitely like the gun violence and education and our school system. It's like, it's failing our children. ROSE: Of course those are complex problems for any mayor to solve, but Brooklyn residents hope one of their own will find answers that have eluded his predecessors. Joel Rose, NPR News New York.